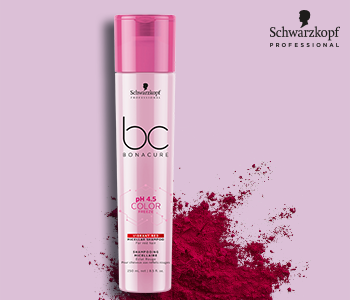 Protect your colour treated hair from damage and colour fade while promoting maximum shine with the Schwarzkopf Professional BC Bonacure pH 4.5 Colour Freeze. Schwarzkopf Professional’s first colour-locking hair therapy, the pH 4.5 Colour Freeze Collection provides up to 90% colour retention right down to the last strand. Each and every colour pigment is captured and sealed in place for a vibrant, long-lasting hue. You've worked hard for your perfect colour, and with pH 4.5 Colour Freeze you have the tools to keep it looking beautiful.